and any of its functions, such as stolen credit card numbers, the loss of or alteration of stored data, etc. • This Organizer is not designed to transfer/receive e-mails by using the E-mail addresses you will store. • The information provided in this manual is subject to change without notice. Do not carry the Organizer in the back pocket of slacks or trousers. Do not drop the Organizer or apply excessive force to it. Do not subject the Organizer to extreme temperatures. 2. Slide off the operating batteries cover. 4. Replace the operating batteries cover. to initialize the memory of the Organizer. For example, press 2 to select English. Noises or shocks may erase some or all of the Organizer’s memory. “CLEAR ALL DATA OK(Y/N)?” is displayed. display and use the Organizer even in low-light conditions. function if the battery level is very low. sound when “ ” is turned off. <Example> Change the guidance language from English to Italian. ★ Do not use the Backlight unnecessarily. work properly until the batteries are replaced. 3. Press C•CE after adjusting the contrast. to to select “1 ITALIANO”. All messages and guidance will now appear in Italian. : Indicates the & key. : Indicates the numeric 7 key. the number key and “ : ” and “ ; ”. desired key to be entered. : A “beep” will sound when a key is pressed. : The schedule alarm will sound. (lowercase) letters, turn “CAPS” off by pressing CAPS . : The listing on the display can be edited. : Indicates that the recalled listing is secret. : Indicates that the operating battery level is low. turn “CAPS” off by pressing CAPS . ), then press the corresponding number. Press SMBL to exit the symbol entry mode. • You cannot enter “았앙 ” symbol. Press 2nd followed by the corresponding keys. Enter “Ä”, “ü’, “é” and “ô” in MEMO mode, for example. menus (see the following table). Press INS to change the cursor from “ ” (replace) to “ ” (insert). Press INS again to change the cursor from “ ” to “ ”. Press DEL to delete the character at the cursor position. to delete the character to the left of the cursor. cases, press C•CE and reenter. • Press C•CE to clear all characters on the current display. desired date and time between Jan. 1, 1901 and Dec. 31, 2099. ENTER . Enter the correct value and press ENTER again. to set the Home city. • Zone numbers 0, 14, and 15 have no city name on the display. between Home and World clock each time CLOCK is pressed. “(+ 5:00)” indicates the time difference from the Home city. Set your local city as the Home city by selecting its zone number. <Example> Set the date and time to April 12, 2001, 10:05 PM (or 22:05). 1. Press CLOCK once or twice to display the Home clock. • The cursor will flash. pressed. AM or PM is displayed for the 12-hour clock (default). once or twice to display the Home clock. • The zone number is displayed on the right side. to your local zone from the cities stored in the Organizer. 4. Enter the hour and minutes. 5. Enter the month, day, and year. to skip entering a number that needs no change. 6. Press ENTER . The clock starts from 0 second. 1. Press CLOCK once or twice to display the World clock. (or PREV ) to set the zone number to 12. 4. Enter the city name (up to 8 characters). 5. Press ENTER to store the new name. 3. Enter the correct daylight saving time/summer time. to set the time as DST. ” appears on the display and DST is now set. 3. Press 2nd ENTER . World clock automatically sets the time one hour ahead. • DST can be set independently in either the Home or the World clock. • Each changed name is stored until you next change the zone number. to select “5 DATE FORMAT”. you were before pressing MENU . by keeping business, private and other listings separate. • To cancel entering the file names, press C•CE twice. 3. Press TEL to check the new file name(s). to select “4 TEL FILE NAME”. 4. Enter the phone and fax numbers. “STORED!” will be displayed briefly, then the listing will be displayed. The telephone listing is now stored. the name entry cannot be skipped. • To enter the next telephone listing, continue to enter in the same manner. • The Telephone listings are stored in alphabetical order. The weekly format can be switched between SUN-SAT and MON-SUN. to display the Calendar mode screen. 1 to select “1 WEEKLY FORMAT”. or 2 to select “SUN-SAT” or “MON-SUN”. which you were before pressing MENU . week can be displayed. Use the following keys to control the display status. : displays the following or previous month. • Hold down either of these keys for rapid recall. : moves the cursor or scrolls the calendar up or down one week. the cursor scrolls into the next screen. • When you reset the Organizer, the calendar defaults to Jan. 1, 2001. <Example> Enter the following data. 5. Enter the schedule detail. the current date (For example, April 12, 2001). • “:00” will be entered automatically. letters for the details as described in step 5. • The hour and minute should each consist of 2 digits. format selected in the Clock mode. 4. Enter the starting and ending time. listing is stored in the memory. 6. Press ENTER to store the listing. PREV ) and change the display day by day until the desired date appears. <Example> Enter a schedule listing on April 17, 2001. 1. Press SCHEDULE to display the Schedule mode screen. date (For example, April 12, 2001). the desired date in Calendar mode” (from step 4) on this page. method is more convenient than the previous 2 ways. • You can set an alarm while you are entering or editing the schedule item. canceled and “ ” will disappear from the display. <Example> Enter a schedule listing on June 26, 2002. “ALARM TIME ELAPSED!” appears briefly. Enter the correct alarm time. mode” from step 4 on page 10.
time entry prompt. Enter the correct date and follow the next procedure. <Example> Set an alarm for June 22, 2001 (Meeting at 10:00AM 11:00AM). 1. Press SCHEDULE and enter the date, time, and schedule detail. and an alarm sound mark (“ ”) is displayed on the left of the display. remain in the memory without “ ”. “ ” will not disappear from the display. arrives while you are exchanging data with a personal computer. to stop the alarm sound. keeping the schedule alarm turned on. ” disappears, and the alarm sound is set to off. the schedule alarm (“ ” mark status) to each schedule listing. • You cannot set the schedule alarm to the listings with no time entry. 2nd EDIT to enter the edit mode, and then enter the priority. • Press C•CE twice to cancel the entry. will be changed to the uppercase letters. • Order of priority is from 0-9, A-Z, then space. to display the To Do entry prompt. to enter the index mode. to mark it as done. the lowest priority and listed at the end of the list. • The Memo listings are stored in alphabetical order. Expense summaries are a collection of records stored in Expense mode. You can recall them for a specific day or a certain period. <Example> The date is April 5, 2001. You bought flight tickets for a business trip for $1,200. <Example> Specify the date, April 5, 2001. 4. Enter the desired date. • The current date will be displayed. 3. Enter the expense amount and press ENTER . to enter the Expense mode. 3. Press 1 to select “1 DAILY”. 2. Enter the expense date and press ENTER . • Press C•CE once or twice to return to the date entry prompt. to enter the Expense report mode. 3. Press 2 to select “2 PERIOD”. correct date and follow the next procedure. to store it in the memory. <Example 2> Register Mother's Day (second Sunday in May). (such as Mother’s Day (second Sunday in May)). every year from 1901 to 2099.
page 10) in the monthly calendar. to enter the Anniversary mode. to select “2 MONTH/WEEK” to display the date entry mode. <Example 1> Enter the following data. “Nancy’s Birthday” on February 12th. 5. Press ENTER to store it in the memory. enter the date entry prompt. 4. Enter the description of the anniversary. TEL2 and TEL3 files is displayed. • The direct, keyword, and index searches are not case sensitive. SCHEDULE, ANN1, and ANN2 files. • When the symbol “ ” or “ ” is displayed, more information exists. scrolls up or down one line. EXPENSE, and TO DO files. unnecessary data to make enough space to store new listings. Recalls the listings in order in each mode. Anniversary mode and then press 1 (or 2 ) to select the searching type. order. Hold down either of these keys for rapid recall. up memory, when the Organizer displays “MEMORY FULL!”. other listings are scheduled for the current day. has been found, “NOT FOUND!” is displayed briefly. to start freeing up memory. • “WORKING...” is displayed indicating that the memory is being freed up. <Example> Display the Index in the Telephone mode. Telephone, Schedule, To Do, or Memo mode. subsequent listing in sequential order will be displayed. Schedule, To Do, or Memo mode. 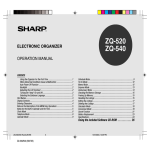 <Example> Recall the listings containing the word “Sharp” in the TEL1 file. • Up to five listings are displayed at a time. listing for that character, the first subsequent listing will be displayed. press ENTER . Next, press ENTER again to enter the index mode. 1. Press TEL to display the TEL1 file. Recalls the listings by the date in Calendar, Schedule, or Expense mode. word “Sharp” will be displayed. the index mode when the entry prompt is displayed. <Example> Recall the calendar or schedule for December 25, 2001. C•CE to clear the displayed date. • To enter a single-digit month or day, enter zero and the digit. The specified calendar or schedule will be displayed. the same as or similar to the previously stored listing. 1. Recall the listing to be deleted. to display the Calendar mode. 3. Press SCHEDULE to display the schedule contents. 1. Recall a listing in the desired mode. • The edit mode is entered and the cursor flashes. 3. Modify the data as desired. 4. Press ENTER to store it in the memory. press 2nd EDIT . You cannot enter the edit mode in the index display. to delete the currently displayed listing. • You can also delete individual listing on the index display. delete, and press DEL and Y . <Example> Delete all listings in the TEL1 files. 1. Press MENU 3 to select “3 DATA DELETION”. 2. Press 1 to select “1 TEL”. 21) and repeat the above procedure. in up to 12 digits. pressing CALC/CONV once or twice. 1. Press CALENDAR to recall the calendar for the desired month.
. “DELETE? Y/N” will appear. The password and all secret listings can be deleted at the same time. to select “3 DATA DELETION”. to select “2 SECRET DATA”. “ALL SECRET DATA DELETE? Y/N” is displayed. twice to clear the display. Press C•CE to cancel the error. 40 = becomes the constant. 1. Press CALC/CONV once or twice to select the Conversion mode. The conversion result is displayed. (or PREV ) to select the conversion display number 1. • The result display disappears and the rate display flashes. 4. Enter the rate (up to 10 digits). such as from £ to $, and then from $ to DM. <Example 2> Convert 25°C to °F. currency or unit in the conversion patterns No. 1 to No. 3. 2. Enter the value to be converted. 1. Repeat steps 1 to 3 of the above section, “Setting the Rate”. changed and enter the new currency or unit. rounding off the number. Use the conversion result for reference. <Example 1> Convert $198 to £. to move the cursor to the rate field and enter the rate. • Up to 7 letters can be entered each for unit A and unit B. 1. Press 2nd SECRET . password, so that no unauthorized person can recall them. Up to 7 characters can be registered for the password. make a written record of the password. To delete and change the password, refer to page 22.
and an “ S ” are displayed. 4. Press C•CE to display the entry prompt. function is off, the “ S ” is cleared even after the password is registered. the entry prompt without the “ S ”. displayed briefly and the display changes into the entry prompt. automatically be turned on after manual or auto power off. 2. Press 1 to select “1 HIDE SECRET”. recalled. The display changes into the entry prompt with the “ S ”. recalled unless the Secret function is off. 1. Press 2nd MARK during the data entry. A “ ” is displayed. 2. Press ENTER to store it in the memory. <Example> Designate the listing for “Xmas presents list” as secret. display returns to the entry prompt. The listing is now designated as secret. 2. Recall the desired secret listing. to enter the edit mode. 4. Press 2nd MARK . The secret listing is now changed to non-secret. Perform recalling (or editing) the secret listings in each mode. want to recall the listing. 5. To register a new password, follow the procedure described in “1. Registering a Password” on page 21. 3. Press 2nd MARK . The “ ” is displayed. The secret listings only are sequentially recalled. Deleting the password and secret listings”. 3. Slide off the operating batteries cover. • Keep batteries out of the reach of children. 4. Remove the old batteries by pulling the ribbon tab. the unit may cause battery leakage and damage from corrosion. • Do not dispose of batteries by fire as they may explode. The Organizer detects two low battery levels which are warning and fatal. 1. Press OFF to turn off the Organizer. 7. Set the battery replacement switch to NORMAL OPERATION. 8. Press the RESET switch with a ball-point pen or similar object. 9. Set the clock to the correct time. When data is continuously displayed without Backlight (at 25°C/77°F). las pilas a NORMAL OPERATION. RESET y luego suelte ON . Por ejemplo, pulse 2 para seleccionar inglés. para omitir la entrada de un número que no necesita cambiar. 7. Pulse ENTER . El reloj comenzará a funcionar desde 0 segundo. 8. Pulse CLOCK para que se visualice el reloj mundial. para seleccionar “2 CONTRAST” (2 CONTRASTE). más oscura o más clara. ). El pitido no sonará mientras “ ” se encuentre apagado. que se visualice el reloj local. ciudades almacenadas en el Organizador. para seleccionar el reloj de 12 horas o de 24 horas. formatos de reloj. Para el reloj de 12 horas, se visualizará AM o PM. número, dirección de correo electrónico y dirección postal. mantener separados los listines de negocios, privados y de otros fines. (Para el reloj de 24 horas, pulse 2205). (Introduzca 2 dígitos tanto para la hora como para los minutos). o 2 para seleccionar “SUN-SAT” o “MON-SUN”. hacia arriba o hacia abajo. visualice el modo de calendario. 2. Pulse C•CE para que se visualice el indicador de entrada de fecha. : para visualizar el mes siguiente o anterior. Ingrese un listín del programa de actividades del 24 de junio de 2001. Z, o puede dejarse en blanco pulsando ENTER . • El orden de prioridad es de 0 a 9, A a Z, seguido de espacio. 1. Pulse ENTER para ingresar el modo de índice. para marcarlo como ítem realizado. semana (como el Día de la Madre (segundo domingo de mayo)). clasifican al final de la lista. indicador de entrada de fecha. para que se visualice el indicador de entrada de notas. 3. Introduzca la fecha y la descripción. 1. Pulse ANN para ingresar el modo de aniversario. visualizar el modo de entrada de fecha. para ingresar el modo de aniversario. Permite llamar los listines en el orden de cada modo. regresivo). Mantenga pulsada una u otra tecla para una llamada rápida. para visualizar el primer (o último) listín en orden cronológico. instantes y volverá a visualizarse el indicador de entrada. 1. Introduzca el primer carácter(es) del nombre deseado en cada modo. 2. Pulse NEXT (o PREV ). para borrar el listín actualmente visualizado. 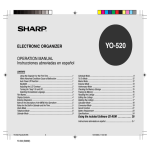 que contengan la palabra “Sharp”. Aparecerá “DELETE? Y/N” (¿BORRAR? S/N). 1. Seleccione el modo deseado. (Por ejemplo, pulse TEL ). (1) Borrado de un listín. 1. Liame el listin que desea borrar. seleccionar “To Do” y “SECRET DATA”, pulse NEXT ). Aparece una lista de los listines llamados, uno por cada renglón. pulse ENTER otra vez para ingresar el modo de índice. 1. Llame un listín en el modo deseado. 3. Modifique los datos según se desee. 4. Pulse ENTER para almacenarlo en la memoria. • La pantalla del resultado se borra y el tipo de cambio destella. seleccione el número de la pantalla de conversión 1: $1 = £0.6). 2. Introduzca el valor que desea convertir. Aparecerá el resultado de la conversión. limits for a Class B digital device, pursuant to Part 15 of the FCC Rules.